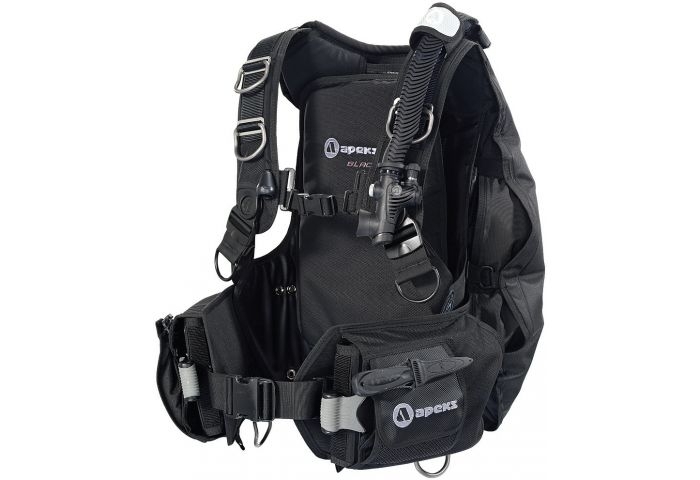 The Apeks Black Ice is a rugged, weight-integrated, back inflation BC designed with the advanced diver in mind. Despite its heavy duty construction, it provides amazing comfort, fit and stability thanks to its Wrapture Harness System (pat. pend.). Due to the modular nature of this BC, a custom fit can be achieved through any of the three sizes. Your equipment should enhance, not hinder the joy and exhilaration of diving. Nowhere is this more important than with BC's, where comfort and freedom of movement must be balanced against function and durability. Responding to this challenge led Oceanic design engineers to create BioFlex - a unique "living fabric" that stretches, flexes and conforms to the body. BioFlex is an extraordinary fabric, which stretches, fully inflated up to 30% over conventional nylon or polyurethane BC materials. The idea being that if a material could stretch while remaining airtight, you could make smaller air cells, creating less bulk and drag underwater while achieving high volumes of lift when required. BioFlex eliminates chest squeeze, conforms to the diver's body and provides a slim, body hugging profile. Oceanic's patented QLR Quick Lock & Release System is standard equipment on the Probe HLC. Your weights stay in position throughout the dive and do not shift around affecting buoyancy or position in the water. The weight pouches are simple to load and easy to release. Best of all, our patented "positive-lock" system helps to ensure that they'll stay put. Exterior abrasion points of the Probe HLC are covered in our new "Fadeless" 1600-denier ballistic nylon - tough stuff that will hold up to years of extreme diving and keep that "new look" longer. Welded and slightly bent for easy, one-handed attachment. Allows for a comfortable and safe fit. Built-in retractor attachment point - perfect for streamlining gauges, lights and other essentials. Located just above both the left and right pockets, a pair of stainless steel grommets keep our SPINNER BC KNIFE out of the way but just where you want it. Ergonomically designed to be functional and easy to use in any dive position, the Reliant Integrated Inflator provides a full range of airway exhaust/inflation control. Simply press a button to produce precise flow for trimming dive attitude or maximum flow for major changes in buoyancy. A large exhaust valve creates a flow rate higher than the inflation rate of the power inflator, improving diver control during ascents. Oceanic's patented depth compensating cummerbund is manufactured from a unique woven elastic material that eliminates the need to readjust as your suit compresses at depth. Oceanic's cummerbund offers up to 20 cm of adjustment to fit a wide range of sizes. For additional customization, the cummerbund may be easily changed with another size. Extra heavy duty padding provides comfort both above and below the surface without having to sacrifice the stability of a hard backpack. Zippered so they're easy to get into. Enough room to store your light, extra mask, Pocket Snorkel, slates, and more! The new AIR XS combines the reliability, performance and durability of the SlimLine OCTOPUS and Reliant INFLATOR into one very low profile, streamlined package. The regulator/inflator combination is as small as many BC inflators alone, with breathing performance superior to many stand-alone octopus regulators. The AIR XS can be added to any existing Oceanic BC or may be purchased already installed on a new Oceanic BC for additional savings. Integrated instrument retractor mount grommet inside each zippered pocket (retractor not included) and Spinner Knife mounting grommets. Optional Air XS 2 Alternate Inflator and Spinner Knife are available accessories.